The Procurement Office is responsible for the procurement of supplies, materials, equipment and contractual services for the University. The Procurement Office oversees other procurement functions including bid solicitations, bid terms and conditions, and equipment inventory. 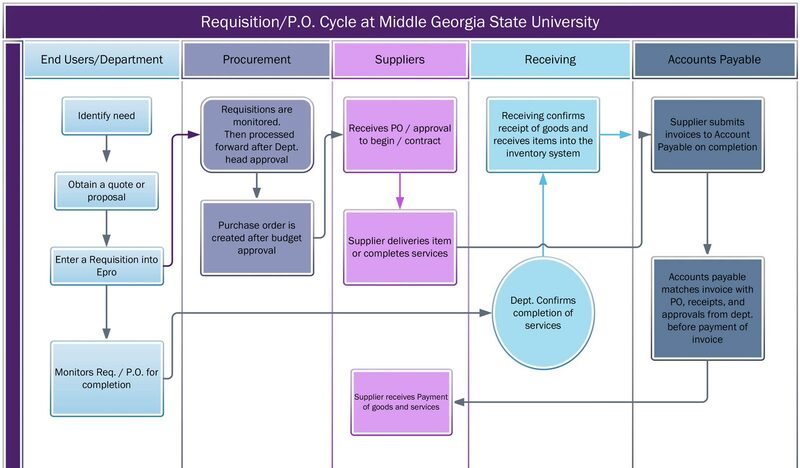 The Procurement Office adheres to the purchasing procedures outlined by the Department of Administrative Services and the Board of Regents of the University System of Georgia. Purchases made by Middle Georgia State University are exempt from most types of sales tax. When traveling, please use the Hotel/Motel Tax Exempt Form. Complete the form and present it to the front desk when checking in. For all other purchases, please use the Sales and Use Tax Certificate of Exemption. These forms can be downloaded below. Any supplies and/or materials purchased with petty cash funds must obtain prior approval from Department Head. All petty cash reimbursement forms must have the necessary approval and receipts. Accounts Payable administers all petty cash reimbursements. The purchase limit is $50.00 per item not to exceed $100 in total. Any items over $50 must be purchased with a purchase order or Visa purchasing card. Petty cash reimbursements may be obtained at either the Bursar's Office on the main campus or at the administrative offices of the Warner Robins Center. Itemized receipts are required for reimbursement, and all requests should be made in a timely manner. PeopleSoft Financials EProcurement system must be used to initiate a purchase order for a department. For more information, contact Barbara Burns at 478.471.2502 or Amy Walker at 478.471.2071. Purchases made with a Middle Georgia State University VISA purchasing card must be for University-related purposes only. All purchases made on your card will be charged against your budget, unless the purchases are charged to another department on the Monthly Card Account Summary. Purchases must be limited to the amount available in your budget. Each month the Monthly Card Account Summary must include the account number, itemized receipts, and the signature of the Department Head/Supervisor. Note: Any orders over $5,000 must be purchased through Procurement Office.